PC-MAPPER AI, is a powerful tool for airborne applications, such as Seasonal Bird Migration, Firefighting, and Military Reconnaissance. It also works well for ground applications, such as Natural Resources Inventory, GPS Surveying, Precision Farming, and others. PC-MAPPER AI will work on a desktop PC, a notebook PC, or a tablet PC running Windows XP, VISTA, or Windows 7. It is an all-in-one professional mapping program, that provides a multitude of functions, to help you perform GPS/GIS tasks efficiently. You may use any GPS with NMEA-183 output to navigate to a point or along a specified route. 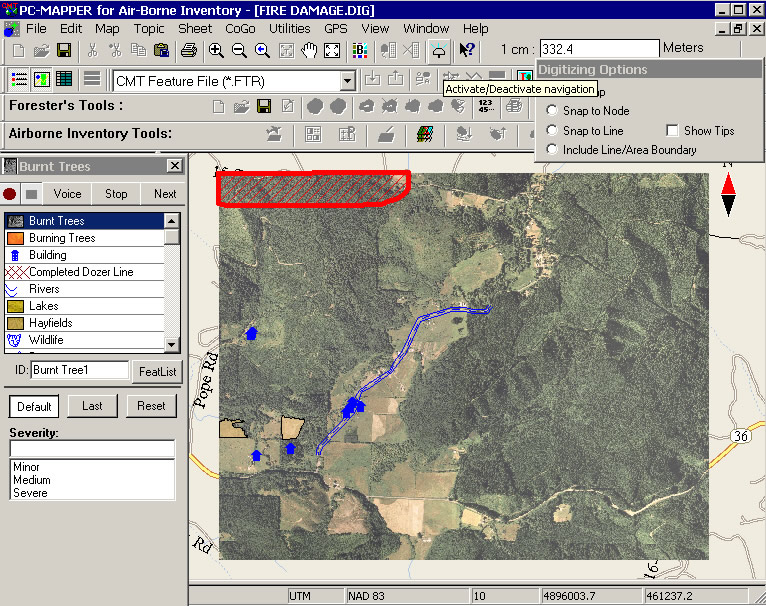 You may collect GPS and GIS data on top of a background map, such as a CMT Basemap, a Google Map, a DRG/DOQQ raster map , or your own geo-referenced aerial map. To facilitate the data collection process, you can have a Feature list prepared ahead of time, that defines and describes the features you will be recording. Instead of typing the Feature names and descriptions, all you have to do is select the appropriate item from the list. The main features of PC-MAPPER AI are listed on the product brochure, a link to which is provided on the right side of this page. PC-MAPPER AI has been designed to handle the special requirements of air-borne data collection, where things tend to happen quickly. For example, one needs to work really fast to accurately count the birds flying by and record the appropriate descriptions. The program is easy to use and saves our customers time and money when compared to the traditional manual recording method. We welcome your suggestions to make the program even more useful for your data collection tasks. Please feel free to post your comments or questions, and join in the discussions on this blog.